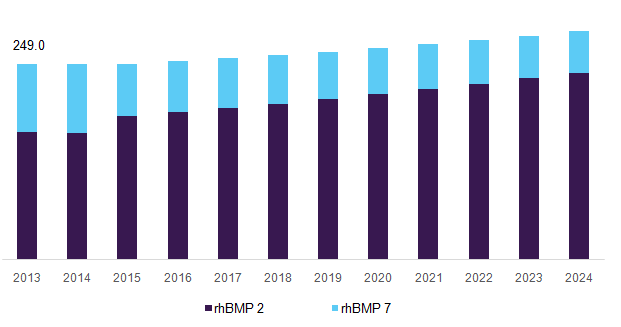 Bone Morphogenetic Protein Market Scale Worth $644.6 Million By 2024: Grand View Research, Inc.
San Francisco, United States, 2018-Dec-14 — /EPR Network/ —The global bone morphogenetic protein (BMP) market size is expected to reach over USD 644.6 million by 2024, based on a new report by Grand View Research, Inc. Increasing incidence of spinal fusion, trauma, and small bone surgeries coupled with demand for faster bone recovery are the key drivers affirming growth of BMP market. Sport-related injuries, growing geriatric population, and increasing awareness about osteoinduction products as an alternative to bone grafting are other drivers accentuating market growth. BMP has reported outstanding results over bone graft, such as lack of donor morbidity, extensive surgical procedure, higher recovery time, pain & numbness, and high cost. Spinal fusion held the largest share in 2015. Increasing cases of sport-related spinal injuries, wide range of product availability, easier usage, and long-term reliability are major factors for the aforementioned dominance. North America held a significant share of over 65.0% in 2015. High number of orthopedic surgical procedures, and availability of favorable reimbursement policies are drivers that can be attributed to for largest share.